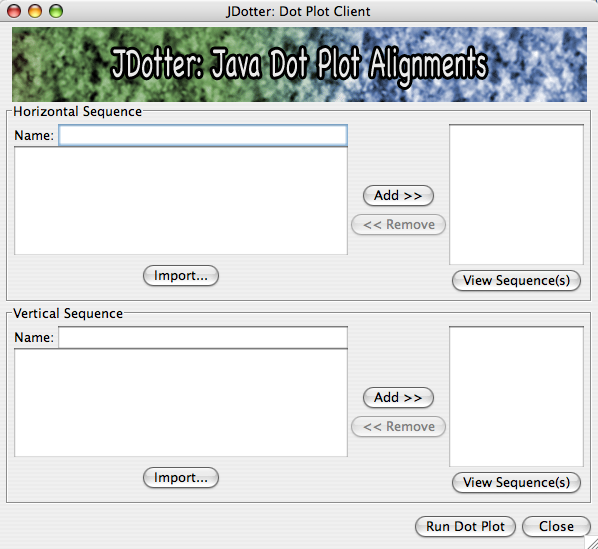 A brief introduction into the usage of JDotter and its main windows and tables. The default DASHBOARD settings use the middle mouse button; you need to change this in the DASHBOARD preferences to be able to use this button for zooming JDotter plots. For more information on Dotter, please refer to the published paper: Gene. 1995 Dec 29;167(1-2):GC1-10. A dot-matrix program with dynamic threshold control suited for genomic DNA and protein sequence analysis. Sonnhammer EL, Durbin R.
The JDotter menu bar can help you load wp-content/uploads/2018/12 and set preferences as well as providing information about the program. For the sequence you wish to plot horizontally, start here by entering a name in the “Name” field (e.g. “horizontal 1”). Input the corresponding sequence into the sequence window immediately below, either by clicking on the “import” button and selecting the file or by pasting the sequence into the window. Now you can click “Add>>” to transfer the sequence to the list on the right-hand side of the window. Selecting a sequence from the list and clicking “<” will delete it from the list. To add sequences to be plotted vertically on the graph, apply the instructions for “The Horizontal Sequence Window” above to the analogous fields of the vertical sequence window. Enter a different name in the vertical sequence “name” field for this sequence. When you have finished entering at least one horizontal and one vertical sequence, click on “run dot plot“. If desired, you can enter multiple sequences to be plotted both horizontally and vertically. Each of the horizontal sequences will be plotted against each of the vertical sequences. Therefore, entering three horizontal and three vertical sequences will yield 3 x 3, or 9 dot plots in total. From the main dot plot window, you can navigate the dot plot, change the grey scale indexing, view the plotted sequences and zoom into regions of interest within the plot. 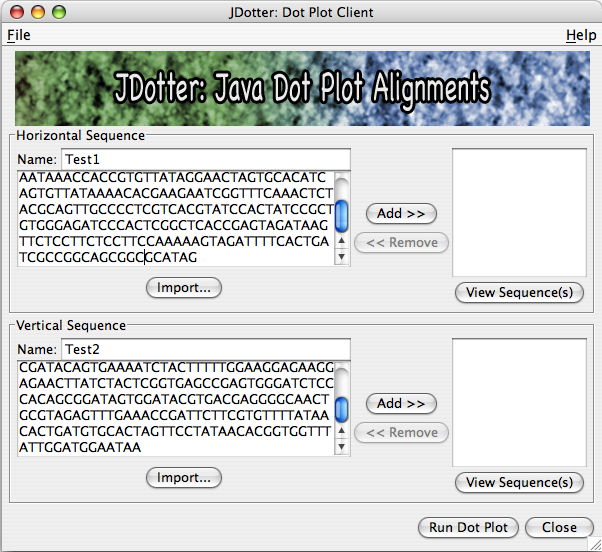 Only one dot plot window per JDotter session may be open at a time; however, you may load data from the main JDotter window as many times as you like. The most recently loaded data will replace the data currently in the display. Clicking on any point in the plot will center the crosshairs at this location. To move the crosshairs manually, use the arrow keys or click and drag with your mouse. The “←” and “→” keys of your keyboard will move the crosshair left and right (respectively) within the plot; similarly the up-arrow and down-arrow keys of your keyboard will move the crosshair up and down (respectively) within the plot. In the example shown above, the area of the plot appears almost entirely gray except for a faint black line running from the top left corner to the bottom right corner of the plot. This line indicates a strong degree of alignment between the two sequences at the positions where it occurs. This is the most predominant line on the plot, however, by adjusting the contrast settings with the GreyMap Tool, it is possible to visualize other regions of similarity between the two sequences. For example, suppose the line begins at (25, 13) and runs along the diagonal to (39, 27). This would indicate matches between nucleotides 25 & 13, 26 & 14, 27 & 15 and so on until nucleotides 39 & 27 of the horizontally and vertically plotted viruses. To select a feature, simply click on the bar that represents it at the top. If you select both a feature from the top and one from the left-hand side, the area at which they intersect will be selected with a red zoom rectangle. If the sequences contain annotated features (ie. 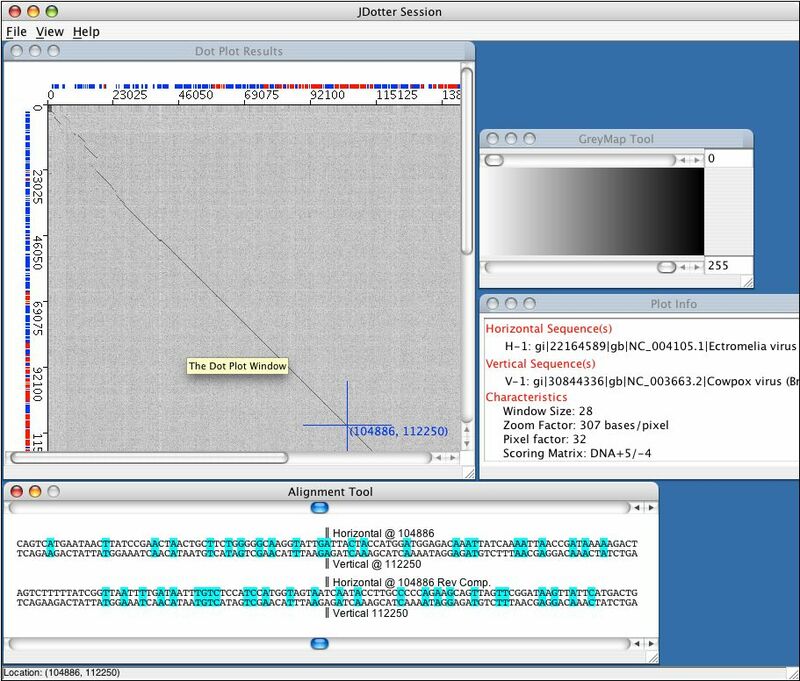 genes of a whole-genome sequence loaded from the VOCs database) they will be displayed along the top and left-hand side of the plot. Features are displayed in red if they represent regions on the top strand of DNA and blue if they exist on the bottom. Labels are written in black, but are only present if there is room on the screen to fit them. The menu bar is used to manipulate the windows, data views, file saving format etc. of the JDotter session within which you are working. From here you can open, save (with extensions .jpg or .jdt) or print a plot. You can also close the JDotter session from the file menu. go to the location of a specific feature in the plot. To do so, select “Go To Feature…“. A dialog will appear showing two lists; the list in the left-hand window represents features that belong to the sequence plotted horizontally while the list on the right represents those belonging to the sequence plotted vertically. The features listed are limited to those that are currently visible in the dot plot window. If you have zoomed in, you may lose some of the features from this list. To see all features for both sequences, select “zoom original” from this menu and the display will reset to the original view of the Dot Plot. This window displays the horizontal and vertical sequences aligned at the position currently centered in the cross-hair. For instance, If the crosshairs are at (80, 44), then the alignment tool will show the horizontal sequence’s 80th nucleotide aligned with the vertical sequence’s 44th nucleotide, as well as the flanking nucleotides. Plot shading can be adjusted with the GrayMap Tool. This allows you to increase or decrease the degree of contrast to better visualize features of the plot. To go to a specific position on the dot plot without manually moving the crosshairs, select Go To Location… from the View menu. Here, you can enter the specific x and y coordinates you would like to move the crosshairs to. The Alignment Tool displays, for each sequence, the immediate region surrounding the point indicated by the crosshairs in the Dot Plot Window. The two sequences in the window will be shown as aligned at this point (e.g. if the crosshairs are located at (65, 80) then nucleotide 65 in sequence X will be paired with nucleotide 80 in sequence Y, 66 with 81, 64 with 79, and so forth.) In other words, the alignment seen in this window represents a 45-degree diagonal line (running upper left to lower right) drawn through the selected point. Brodie R, Roper RL, Upton C. (2004). 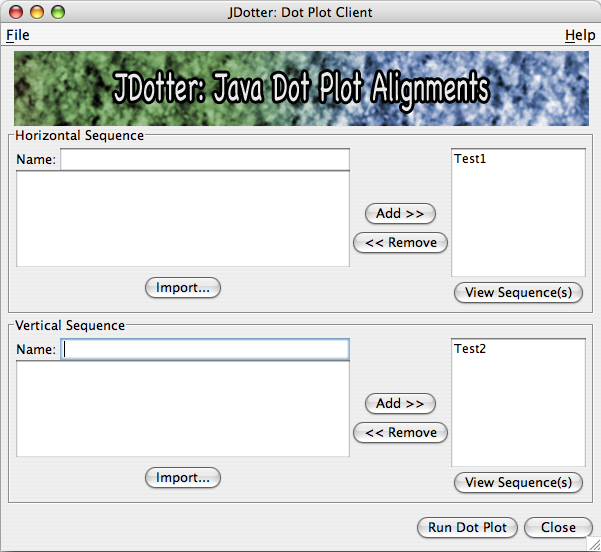 JDotter: a Java interface to multiple dotplots generated by dotter. Bioinformatics. 20(22); 279-281. Ehlers,A., Osborne,J., Slack,S., Roper,R.L. and Upton,C. (2002) Poxvirus Orthologous Clusters (POCs). Bioinformatics, 18, 1544-1545. Junier,T. and Pagni,M. (2000) Dotlet: diagonal plots in a web browser. Bioinformatics, 16, 178-179. Sonnhammer,E.L. and Durbin,R. (1995) A dot-matrix program with dynamic threshold control suited for genomic DNA and protein sequence analysis. Gene, 167, GC1-GC10. Upton,C., Slack,S., Hunter,A.L., Ehlers,A. and Roper,R.L. (2003) Poxvirus orthologous clusters: toward defining the minimum essential poxvirus genome. J. Virol. 7590-7600. (　･ω･) to the cluster job?